While the Diabetes Coalition engages in various assessments, prevention, and outreach events throughout the year, the majority of these activities occur during Diabetes Month and Week each November. 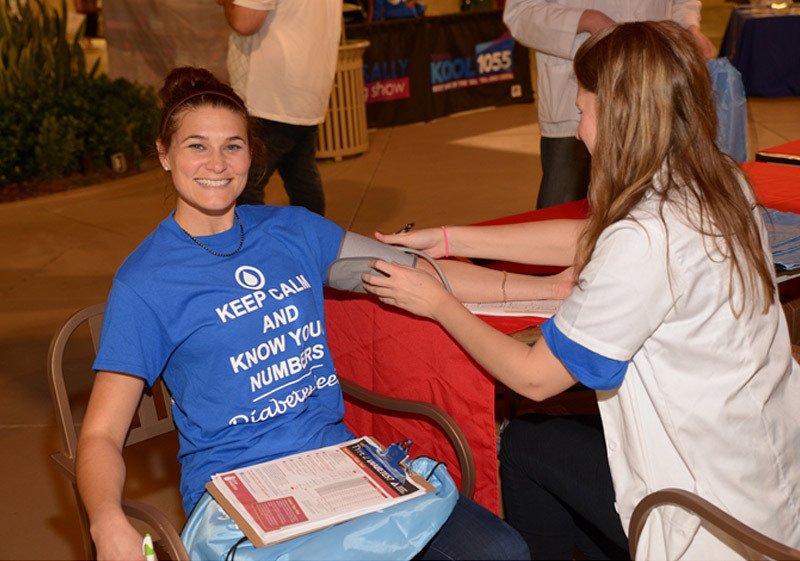 During the month, risk assessments, glucose screenings, prevention and education events occur throughout Palm Beach County. Multiethnic and non-English speaking populations are also targeted, by having bilingual healthcare providers and volunteers, offering risk assessment tools and resource materials in Spanish and Creole. Working in tandem with Enroll America, the Diabetes Coalition referred 70 individuals for assistance in securing healthcare coverage. Our goal is to expand this partnership. Members and volunteers are the “mainstay” of the Coalition’s initiatives and are ultimately responsible for each event’s success. 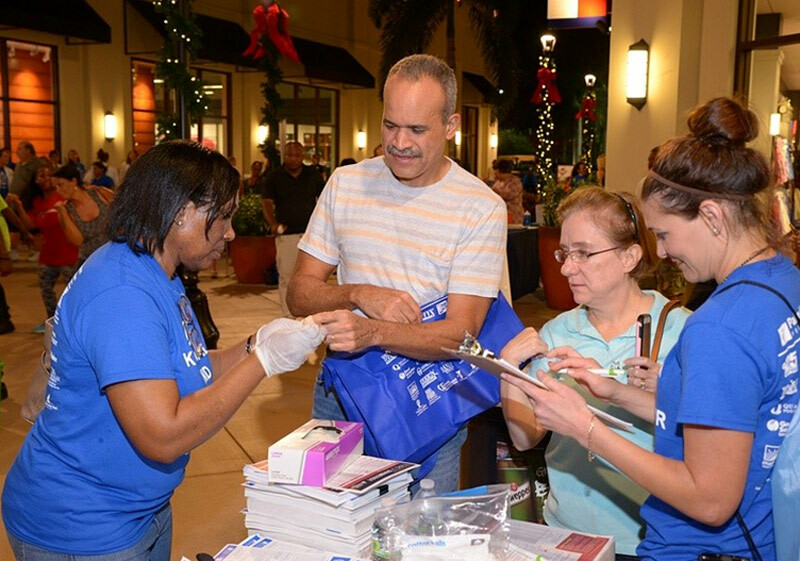 For the 2015 Diabetes Week events we had over 50 volunteers with an additional number of volunteers helping at the Palm Beach Outlets Diabetes Awareness Day. Our volunteer core represented high schools, universities, civic organizations, healthcare providers, Italicize Diabetes Awareness Day and businesses. 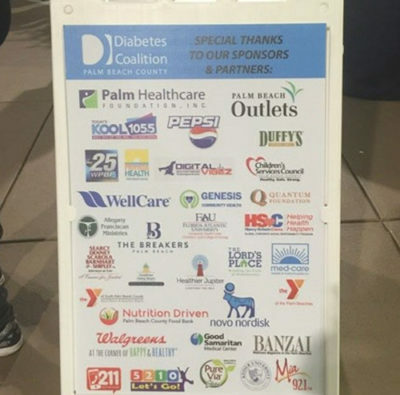 In addition to Palm Healthcare Foundation our founding partner and premiere sponsor, the Coalition has worked hard to establish collaborative relationships with other sponsoring partners. For Diabetes Week, 13 new sponsoring partners “came aboard”. The funds and donations received provide monetary support for educational materials, needed medical supplies and equipment, participant “goodie bags”, and Know Your Number Resource Guides (English, Spanish and Creole), T-shirts for members and volunteers, and free raffle tickets for donated gift baskets and certificates. We are truly indebted and grateful to all of our sponsoring partners for their support. 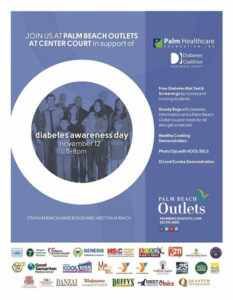 Diabetes Awareness Day represents the Coalition’s premier event of Diabetes Week and is hosted by the Palm Beach Outlets. Over 300 people attended last year’s event. In addition to free diabetes risk assessments and glucose screenings, the community is invited to join the Coalition, its partners and volunteers for a day of learning, while having fun. Over 30 Partner Organization Booths provided educational resource materials and helpful tools about diabetes prevention, healthy lifestyle changes and other health-related information. Sampling locally-grown fresh vegetables and fruit from Nutrition Driven, a mobile food pantry run by Palm Beach County Food Bank. Healthy Cooking Demonstrations” prepared by our esteemed guest chefs Robert Colmen and Joseph Morera. Zumba Dancing (led by Digital Vibez). Free Raffle Tickets for Gift Baskets and Certificates all donated by our sponsoring partners. In addition to providing individual health-related information, data from risk assessments conducted throughout the year are compiled and analyzed annually. The Coalition generates a report containing demographic and geospatial data that is made available to members, partners, and the public for use in their prevention, health care intervention, and educational outreach efforts. The initial data analysis findings for 2015 can be found in this report.